ate one recent night I was walking past a martini bar in the Pearl District and caught the young woman closing up shop dancing a hilarious little shimmy  the kind one never wants anyone else to see because it was only a quasi-dance. OK, besides the bar being a tad Pottery Barn-ish fer me, I warmed to the place because of the disarming and funny moment. Yep, handle your scandal: So you got caught enjoying yourself and at work no less ... Good on you! Sometimes you have to forget about everyone else. Sometimes you've gotta make your own weather. As a musician, I learned how sounds and patterns set up expectations and a mood; they also create pace and momentum. A musician learns how to move people. I learned discipline there, too. I also experienced sheer immersive excellence from playing Beethoven and a Guarneri (once). Guarneri was the chap who taught Stradivarius how to make violins and, yes, they are better. From music I also learned how to get into "the zone" at the blink of an eye ... other artists and writers often wonder how I get so much done; well, that's how. However, I have been an artist the longest ... I started painting landscapes in oils at age six. In addition, athletes learn to pace themselves and train. Through the early influence of Muhammad Ali, I learned you could pretty much say anything as long as you could back it up in the ring. Ali was the single most amazing thing of the '70s, and I have to put him as one of the five top people of the 20th century, alongside Henry Ford, Jimi Hendrix, Henri Matisse and Einstein. A case for Buster Keaton, the Beatles, Martin Luther King Jr., Gandhi, Frank Lloyd Wright, Robert Oppenheimer, FDR and Menachem Begin (for a real twister) could be made. But I won't. I contend that exemplars of action have more influence (for and against their actions) than designated leaders of nations or even direct activists. 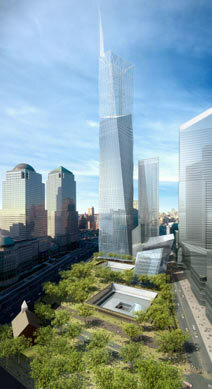 Freedom Tower: an unparalleled tribute to mediocrity by committees? I come from a family that has affected things on a historical scale so I never really had the option of thinking that individuals had no effect on their world. Now I've been in Oregon for five years and as much as I'd have preferred to quietly sit down and be given a Nobel Prize for drinking strong coffee and shooting rhetorical holes in the rhizomatic Marxist bureaucracies of Gilles Deleuze while listening to the "horn throwing" rock of Blonde Redhead in Northwest Portland coffee shops ... I suspected that wasn't going to happen. Besides, nothing happens here without a push. But there is also an intense civic intelligence in Portland that I find in very few U.S. cities. What's more, it's different than the intelligence I find in San Fran or New York, where all ideas seem to have a "done that already" qualification; yet those projects still plow ahead in self-parody. Here almost everything is for the first time, or at least it appears that way. The new plan for the World Trade Center is a case in point; it is clearly a parody of what everyone wanted it to be. A building with tacked-on wind turbines? Why? To recall a time of nostalgic prop-driven airliners which lacked the explosive jet fuel of an appropriated 727? For a local example, there is the Portland Building by Michael Graves. Its groundbreaking but crummy design was basically the fault of architectural Deus-ex-Machina Philip Johnson. I find most of Johnson's own work overrated; then again, it's true to form since his clients are mostly highly rated A-list corporations. Graves' Portland Building, with its very un-hypothetical (bathroom-like charm) failings virtually inoculated Portland from the later bastardizations of Deleuze and Jameson that fueled mid-'80s postmodern architecture. Translation: I suspect Portlanders saw postmodernist architectural pastiches as "so 1980" ... even in 1980. My sandcastle installation, "I am Switzerland III." 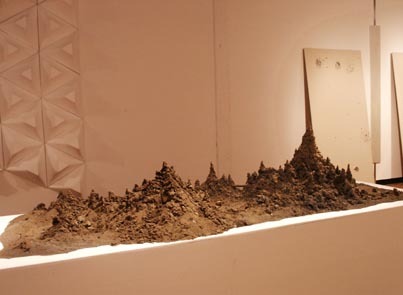 Background work by Justin Oswald (left), Jacqueline Ehlis (right); from Battle of the Artist Curators, Haze Gallery, November 2003. Parts of the show were commentaries on '70s minimalism. Despite the foresight, Portland got even more conservative in terms of architectural statements. Instead, there was a retreat during the '80s. Portland was a place where people liked to be where they were and quietly progressive  like a town that wasn't a town. 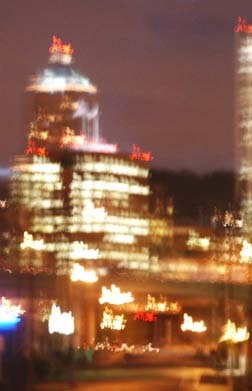 Problem was, Portland was growing up. The buildings got bigger and nearly two million people now live in the greater metro area. By 1992 the city had some critical mass, but not a mass of serious criticism. Instead, "no" was the status quo and nothing was given a very serious shakedown. Really, it wasn't the worst plan: chill out and wait to see what happens. It also allowed visual artists the opportunity to be the first to shake up that status quo; architecture is very slow compared to the other arts. Thus, despite being a rather private, bookish, research-in-musty-archives sort, I realized I'd have to roll up my sleeves and annoy people until they started taking cultural endeavors more seriously in the sleepy Portland of five years ago. I wasn't the only one ... and that meant polarizing dialog. Of course, I would rather just make my paintings and write my book but it's a tricky catch-22 in this "Sweden with SUVs," as Peter Schjeldahl called Portland in 2001. Before one could unveil anything really good here there had to be a mechanism or two to get credit for the effort. That meant a critical and aesthetic audit. It seems to be working now that quality of discourse in concept and execution is finally an issue that is being discussed. The artists in Portland are starting to get noticed. In the visual arts, if a tree falls in a forest and no one sees, it simply did not happen. I have heard it a hundred times: Portland has seen these blips before, but a real change and consolidation is taking place in a way that is very different. Consider the mass of top-notch MFA grads coming here. Consider Haze Gallery making more in sales in March than most longtime galleries. Consider a real-estate boom of lofts and condos in the gallery-laden Pearl District. 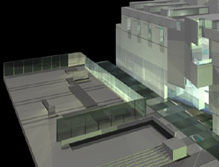 Consider a massive new contemporary art wing on the museum in 2005. Then consider years of art-scene churning that have occasionally out-contemporaried nationally known institutions like PICA and made the Portland Art Museum's recent Biennial look silly. I would say something lasting is about to happen; question is: to what shape will it take and at what level? Despite this looming onslaught of potential boom or bust, I have to say I absolutely love the vibe here and genuinely like most everyone I've met (even the assholes). Artists from the Play show putting in a long day at the office. 1) Meeting Jim Hodges and Shelly Hirsh at PICA and having a fun time talking about mostly nothing ... then mentioning that I am a critic. They gave me this look as if I had died; they seemed so sad. I wanted to explain that I have been an artist since age six, working in oils and doing stained-glass windows … being a critic is just a way of catalytically focusing others and myself, isn't it? I can use my evil word-powers for good! 2) On Sept. 11, 2001, the five artists of the Play show met to discuss the show's final proposal at the Aalto Lounge. Obviously, all hell was breaking loose that day. Bruce Conkle and Todd Johnson were driving a box truck through Idaho and arrived relieved to be out of the survivalist zone. Discussions were frank and matter of fact about the events of the day. I got the reassuring feeling that civilization falls back on its artists in such times. 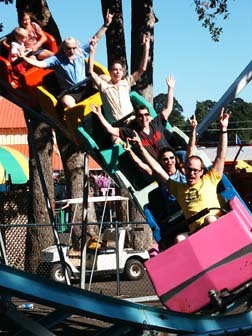 The interesting thing was that none of us were too surprised by the events ... it was not beyond imagination. Lastly, we all knew people in New York. 3) Two people in Gumby suits burst into the Play show opening at PSU. Another friend is roller-skating in the gallery ... PSU's anti-alcohol policy is not a detriment and things are festive anyway. Chandra Bocci curates herself into the show with a mini-installation next to the comment book. 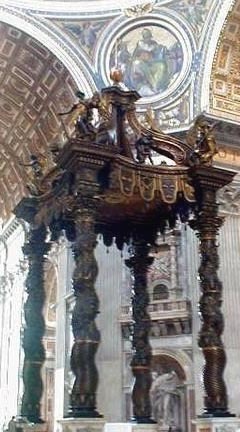 Bernini's "Baladachino," at the Vactican. 4) At PICA there is a meet-and-greet with Dave Hickey, one of those people who annoys me intensely because he published many of my ideas before I could. I developed quite separately of him and my thinking is more flexible. I love both Egon Schiele and Donald Judd; Hickey is clearly wrong about Norman Rockwell. Besides, nobody imitates a caricaturist. Yet he seems to think Rockwells are some secret password of Americana, whereas they are really just a wackier, more mannerist version of reality that nobody believes existed ... sort of like the Brady Bunch. We were on the roof of the W+K building and a young Reed professor was testing his brain with the typical academic flurry of detailed questions, mostly about Etruscan pottery. It's the sort of thing one does when one wants to prove one is not dumb. Hickey is game (the prof is cute), but I can tell this is kinda his daily boredom routine. I get the same thing sometimes: Some hotshot college kid wants to explain the relevance of Bernini's Baldachino to Frank Gehry's designs. Yawn ... sorta forced ... yawn. Hickey eventually launched into a litany of who is useful on an intellectual level: Pierce, Pater, Ruskin (he found Derrida useless). He springboards from this list to describe the process of seeing. The prof mentions the ubiquitous John Berger, who is very matter of fact and not so useful. 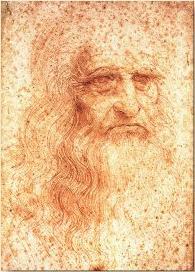 da Vinci: just a guy with an eye ... but what an eye! Hickey obviously does not want to go down that eight-lane highway of academic platitudes. I jump in: "really, it's so much older than all that; how about da Vinci's description of a 'kingdom of the eye'  it predates Bacon and works better than all the postmodern dissecting tables. Leonardo's shield had an effect, not just an anatomy-lesson quality." Hickey quickly turns to me, no longer in defensive stump-speech mode, "that's the guy ..."
Hickey seems to be both pleased and pissed. I know the feeling. Since his death in 1519, Leonardo is still freaking people out, having eaten our lunch already in so many ways. And I wasn't interested in testing Hickey or myself, but it was interesting to note what makes people feel a day late and a dollar short. 5) Being famished and eating two full entrée dinners and splitting a bottle of wine with Jack Daws, Matthew Picton and Ephraim Russell the weekend before The Best Coast show opened. The conversation is great, with a wide-ranging discourse over Aristotle's assertion that all great art must be ambivalent (Plato didn't even think art was useful). We decide Aristotle's idea does not work for 2003. "Power Nap": a painting I completed on site at The Best Coast; a kind of daydream of a painting that evolves past white walls. Somehow, the question of the core human experience implied connected interaction with one's universe, not an idealization or segregation of it. Maybe a different humanism is necessary today ... one which helps facilitate empathy between unrelated things, like Picton's manmade sculptures of natural forms or Russell's useless but fascinating ergonomic objects. We were all talking about design with empathic acknowledgement of both the human and the other built into it. I guess that instead of modernism, it is something cultivating attachment  not the throwaway snarkiness of ambivalent culture. It is not all pure utility or consumer choice. There can be attachment and loyalty, too. In one wild moment someone asks, "so did Aristotle lay the groundwork for the ambivalent consumerism of fast food?" We staggered back to the exhibition space in an industrial wasteland of warehouses that will some day be very developed. Artists get there first and now the city's best restaurant, clarklewis, is in the building that only 10 months ago housed The Best Coast. I am glad the restaurant carries forth the same theme of elegance coming from an acknowledged rough industrial interior and a very matter-of-fact presentation and bit-by-bit sampling of very high-quality food. The Best Coast did the same with art, somewhere between a studio visit and a farmers market with marfa-esque elegance. Its about essentials, not the trappings. What I have learned: It's better to test outside the bell curve and let 'em just try to figure out if you are either very stupid or very strategic. What I've also learned is that, far from just a bunch of ironists or pageantry mongers, artists create and catalyze culture. Maybe they don't invent it, but artists facilitate and catalyze the distinction between a subsistence human settlement and an outpost of civilization where mankind's philosophy and the universe's unknown remain in constant, conversant flux. Artists worth remembering take the atmosphere around them and alter it. Under the right circumstances (usually a few artists doing their own thing) the climate changes become more lasting. It isnt done by committee or with buildings, but with statements by individuals who simply won't accept what is already out there.